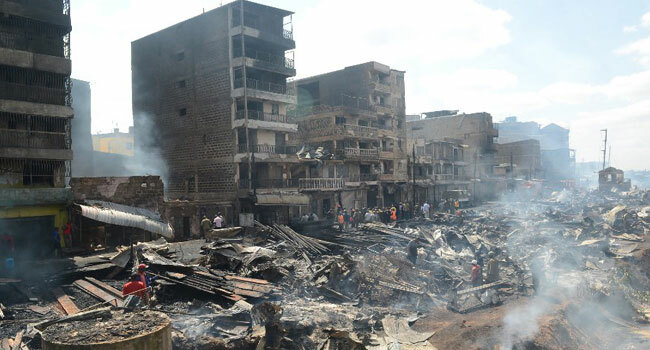 A fire at Nairobi’s Gikomba market on Thursday killed 15 people, less than a year after a blaze destroyed much of the Kenyan capital’s largest open-air market. “We have lost 15 people from this tragedy this morning. “We’re yet to establish the cause of this fire,” he said, which is believed to have started in a timber yard,” said a government official who is the regional coordinator Kangethe Thuku. The pre-dawn blaze left over 70 people injured and destroyed many of the market’s wood and tarp stalls where second-hand clothes, shoes and vegetables are sold on the eastern side of the city. A police officer at the scene said emergency services continued to search the area. “We are still trying to get to some corner [of the market] which has heavy smoke, because part of the area has not been accessed due to live electric wires,” the officer said.